The World Yo-Yo Contest, the largest gathering of competitive yo-yo players and fans worldwide, wrapped up in Shanghai on Sunday. It's the first time the event has been held in China. The four-day event, which lasted from August 9 to 12, included over 500 contestants from the four continents of Asia, Europe, the Americas and Oceania. 12-year-old Terrance Want from Canada has been doing the sport for about five years. He says it allows him to be creative and that is what he likes about it. Yi Chenghao, a Chinese contestant, normally practices for up to six hours nonstop every day before a contest. “If you don’t have perseverance and confidence, you can’t make it,” he said. 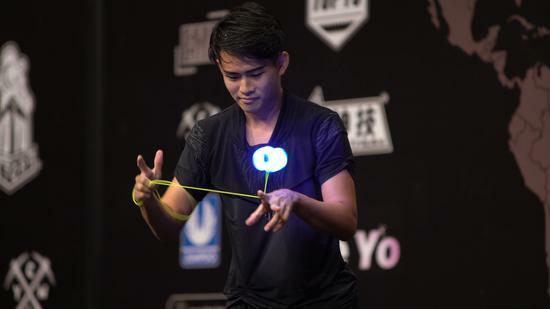 At the finals, players in each of the five main divisions, which were designated 1A to 5A, were given three minutes to perform their best yo-yo skills in front of judges and fans. Three Japanese contestants were crowned world champions: Shu Takada from the 2A division, Hajime Miura in both the 3A division and 4A Division and Sora Ishikawa of the 5A division. Evan Nagao from the US won the 1A division title. Established in 1992, the modern World Yo-Yo Contest was originally part of the International Juggler’s Association (IJA) but the organization and management of the World Yo-Yo Contest was eventually transferred to the International Yo-Yo Federation (IYYF) in 2014.